An overcast and damp morning welcomed bowlers and spectators from all parts of the Province to the 2018 West Lancashire Masonic Charity Bowling Tournament at Fleetwood Bowling Club, which is situated a few steps away from the tram and ferry termini. The weather, however, did not deter the many entrants who competed in this year’s competition. 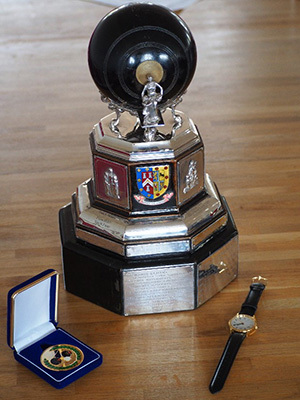 The Cowper Trophy, along with the winner’s medal and presentation Masonic watch. The event this year was hosted jointly by the North Fylde, South Fylde and Blackpool Groups. It was superbly organised on the day by tournament secretary Trevor Barber, treasurer Len Hart and assistant secretary Alan Jones, with a special mention for John Eastwood whose mastery of the microphone was key in assuring that the players arrived on the correct green in time for their matches. The standard of bowling was as ever, first class, with many games going to the wire. The mood was highly competitive but very friendly and good natured, with plenty of friendly banter. It was apparent that many competitors were meeting with their many friends from other groups within the Province, with whom they had contested at previous tournaments. With two greens being available throughout the event, Trevor managed to keep his cool in the office and kept everyone on track. The main tournament for the Cowper Trophy produced an exciting final, between David Thornton of the North Fylde Group and Khine Lynn of the South Fylde Group. Khine eventually emerged victorious but both players contributed to an exceptional match. At one point, David was 15 points behind but staged an incredible fight back to bring the scores to 18 to 21 in Khine’s favour. It was fitting that Khine had finally become a winner in this competition, having worked tirelessly for many years in support of this competition. The Cowper Cup medals are presented to the winner and runner-up and have been for several years. These have long been provided by Khine Lynn and it was unanimously agreed as appropriate that this year he had finally won one himself. Both players also received a Masonic watch as mementos of their achievements. Pictured left: David Thornton (left) watches Khine Lynn bowl during the Cowper Trophy final. Pictured right: Doug Lace (left) watches Brian Rigby bowl during the Cyril McGibbon Trophy final. 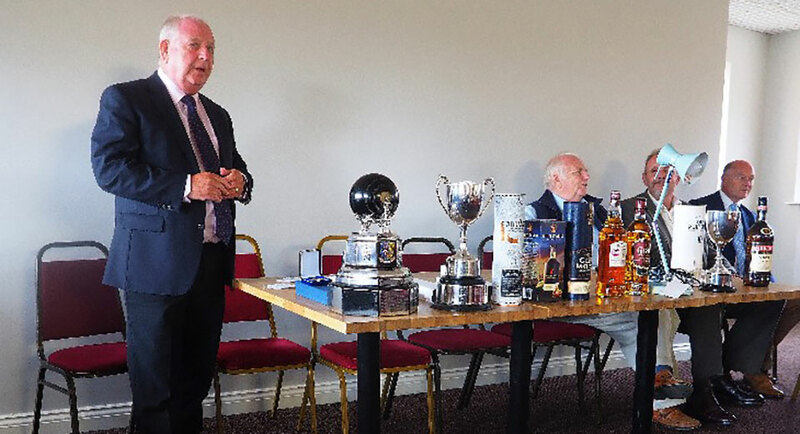 The players who were eliminated in the first round of the main competition were automatically entered into a secondary competition, playing for the Cyril McGibbon Trophy. The final was again gripping, with two very equally matched players, Doug Lace of the Woolton Group and Brian Rigby from the Preston Group. Brian emerged victorious from this battle and was later presented with a bottle of fine malt whisky by Deputy Provincial Grand Master Philip Gunning, who is the West Lancashire Masonic Bowling Charity Vice Patron. Philip also had the pleasure of presenting runner-up, Doug Lace, with a bottle of Napoleon brandy. Pictured left: Harry Cox (right) receives a cheque from John Eastwood. Pictured right: Philip Gunning (left) thanks Harry Cox for the cheque from the 2017 Warrington finals. Paul Davies of the Wigan Group. All of these competitors were placed between third and eighth respectively. 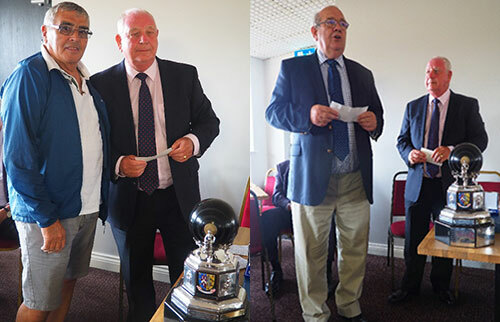 Presentations of the different prizes were made variously by Provincial Senior Grand Warden David Asbridge, Provincial Junior Grand Warden Peter Allen and Mark Matthews, the vice chairman of the tournament and Chairman of the Liverpool Group. During the presentation ceremony the chairman of the tournament, Past Assistant Provincial Grand Master Harry Cox, extended his gratitude to all those who had competed in the event. He added that he hoped that they had enjoyed the day, some having travelled long distances to attend. Harry also thanked everyone for staying for the presentations. Harry welcomed cheques which were presented by the North Fylde Group representative John Eastwood totalling in excess of £1,000, on behalf of the groups hosting the event. A raffle with some excellent prizes donated by many attendees raised over £250 on the day. Harry then presented a cheque to Philip Gunning for a further £1,000, which represented the residue of donations from the 2017 competition, which had been held at Warrington. The initial cheques presented on that occasion totalled £2,500, this last cheque was made out in favour of the West Lancashire Freemasons’ Charity. Philip thanked everyone for their generosity towards several charitable causes. He also praised and thanked everyone for their hard work in ensuring the success of this event. Harry Cox (standing) introducing the presentation ceremony and prizes. Story and pictures produced by Peter Dunn and Glenn O’Brien.